When my turn rolled around, I’d spend a fair amount of time irritably bagging twenty raisin-Goldfish-cheese combo packs, which went over okay, but other parents would show up with home-baked anise-scented buns, carefully balled melon, or tiny quiches, making me feel like a loser. Shortly before the girls moved on to kindergarten and I was relieved of snack duty, I discovered these muffins, and I won the contest for best snack-bringer, at least in my own mind. Now that my girls are at the other end of the educational spectrum, I just might throw some of these into a college care package. 1. 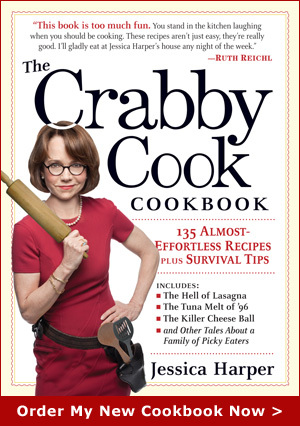 Preheat the oven to 425ºF. Place 12 paper liners in a standard muffin tin. 2. Combine the flours, baking powder, baking soda, cinnamon, ginger, nutmeg, and salt in a bowl. 3. In a larger bowl, beat the pumpkin puree, milk, maple syrup, oil, and egg together until well blended. 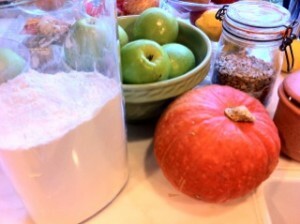 Add the dry ingredients to the pumpkin mixture, mixing just until all the ingredients are moist. Fold in the chopped apple, and the raisins and/or sunflower seeds if you’re using them. Fill the muffin cups about two-thirds full with batter. Optional: Mix up a cup of confectioners’ sugar with 1/2 cup of maple syrup and drizle it over the muffins. This entry was posted on Friday, December 24th, 2010 at 4:15 pm	and is filed under Breakfast. You can follow any responses to this entry through the RSS 2.0 feed. You can leave a response, or trackback from your own site. Hi, it makes 18 or so, depending on how much batter you choose to use for each one. If you are like me, you only have one muffin tin, so bake twelve, then refill it with the remaining six.